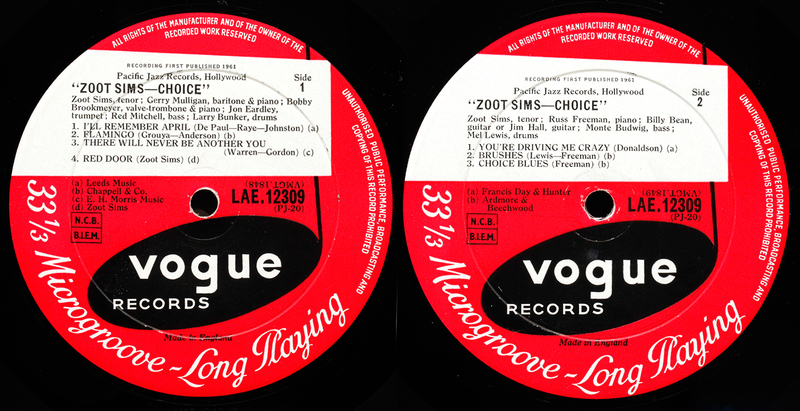 Choices it’s called, choices you get – 1954 and 1959 – two different recording dates with two different groups, one track selection from each side. 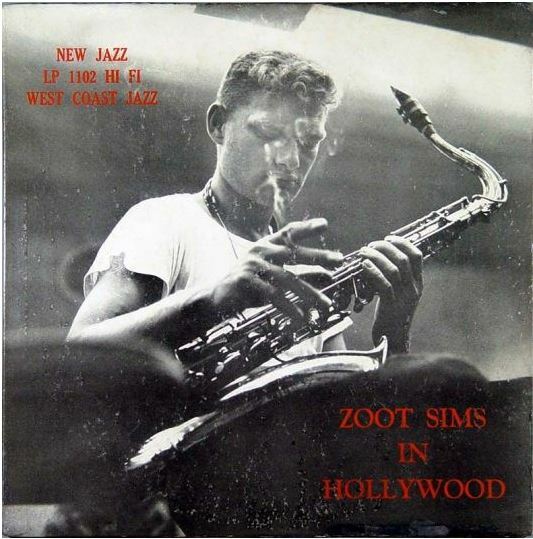 Both share Zoot’s muscular tenor, and uncompromising belief in how he wanted to play. 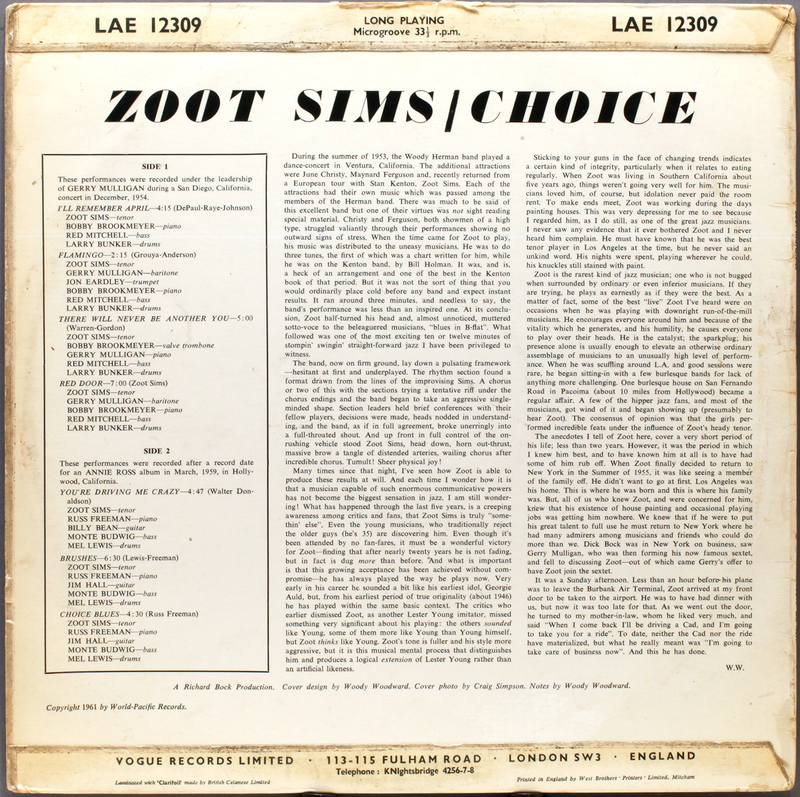 Zoot’s output was prodigious, playing in big bands in the Forties, a solo artists in the Fifties, and playing and recording right up to his death in 1985.This is early Zoot, but given lots of space to play it his way – melodic, perfectly paced, with rich tenor voice and treading an inventive path between old and new. Bob Brookmeyer forsakes his customary valve trombone for piano here. Vogue label, pressed by Decca, first UK imprint of this US West Coast recording from Pacific Jazz dating from the mid to late Fifties released here in the very early Sixties. Customary 1B first press matrix code. Hear those symbols resonating in the I Remember April opening. Beautiful recording. Showing signs of its age, but also perhaps being a well-loved record. As a result of strong sentiment for this period of time, with a slightly cultivated “bad boy image”, he remains collectible and enjoys a strong following today, judging by the stiff competition for original pressings on eBay. He also plays great tenor. Having lost on a number of auctions on Zoot records, I was pleased to come across this in the racks of one London store, just in, and just over a tenner. A bargain considering the great job Decca did pressing these Vogue releases. A first UK pressing, vinyl in good shape, but cover with a lot of wear and tear. So it goes, see it, buy it, enjoy it, worry about it later. 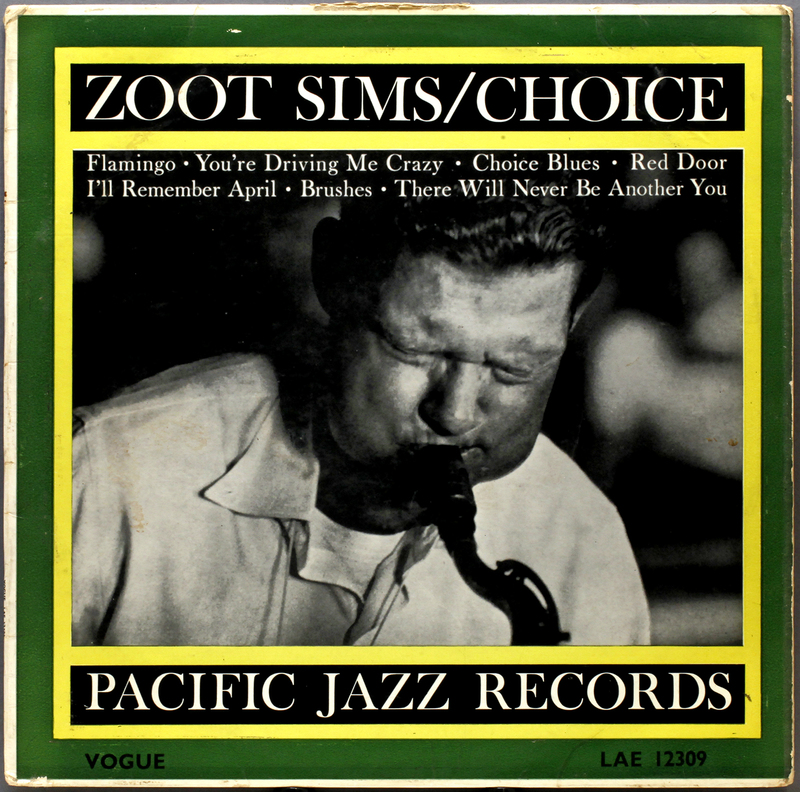 This entry was posted in Pacific Jazz, Vogue, West Coast, Zoot Sims and tagged Billy Bean, Bob Brookmeyer, Gerry Mulligan, Jim Hall, Jon Eardley, Larry Bunker, Mel Lewis, monty budwig, Pacific Jazz, Red Mitchell, Russ Freeman, Vogue, Zoot Sims by LondonJazzCollector. Bookmark the permalink. Vogue is great! You can’t beat Decca pressings for quality. I took a chance on a Vogue stereo pressing of “Chet Baker and Crew” (SEA 5005) for $25. It’s a stunning Richard Bock true stereo recording from 1956(!). Definitely grab it if you come across it. Some great playing on Tenor from the highly underrated Phil Urso and featuring Bobby Timmons on piano.